How can I get automated e-mails in several email accounts? HOME > SETUP AREA > How can I get automated emails in several email accounts? STEP 2: Select the email template you wish to update by double clicking on it, or click on OPEN. STEP 3: Click on EDIT and enter the new email accounts you wish to add, under the BCC field. You can add several email accounts on BCC field, as long as you separate them by a semi-comma (;). STEP 4: Click on the button. 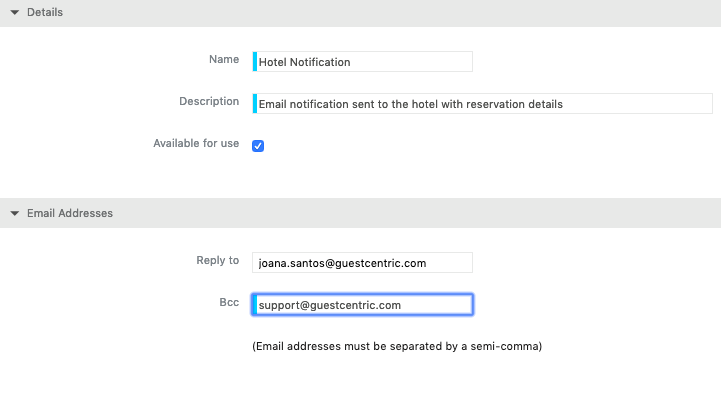 The Hotel will be able to forward emails automatically from the email accounts. By using a rule, any received e-mail messages that match conditions specified in the rule can be forwarded or redirected to another e-mail account. For example, all e-mail messages from a sender or with a subject that you specify can be forwarded or redirected. For more information on how to set up the main contact details, click here. If you wish to configure more e-mail accounts to receive different types of notifications, please check the instructions here.